Mesa is a city in Maricopa County, in the U.S. state of Arizona. 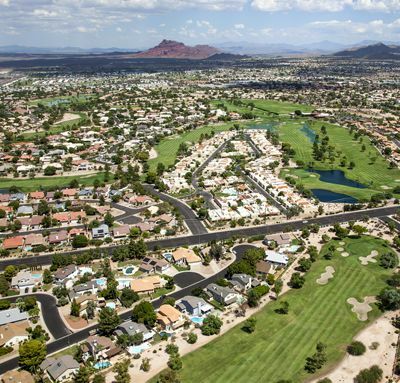 It is a suburb located about 20 miles (32km) east of Phoenix. Mesa is the central city of the East Valley section of the Phoenix Metropolitan Area. It is bordered by Tempe on the west, the Salt River Pima-Maricopa Indian Community on the north, Chandler and Gilbert on the south along with Queen Creek, and Apache Junction on the east. Mesa is the third-largest city in Arizona, after Phoenix and Tucson, and the 36th-largest city in the US. The city is home to 439,041 people as of 2010 according to the Census Bureau. Mesa is home to numerous higher education facilities including the Polytechnic campus of Arizona State University. The history of Mesa dates back at least 2,000 years to the arrival of the Hohokam people. The Hohokam, whose name means "All Used Up" or "The Departed Ones", built the original canal system. The canals were the largest and most sophisticated in the prehistoric New World. Some were up to 90 feet (27m) wide and 10 feet (3.0m) deep at their head gates, extending for as far as 16 miles (26km) across the desert.